Today's Guest Bum is Watchuseek member hwa, a friend of The Time Bum and a regular at our DC Watch Nerd Dinners. 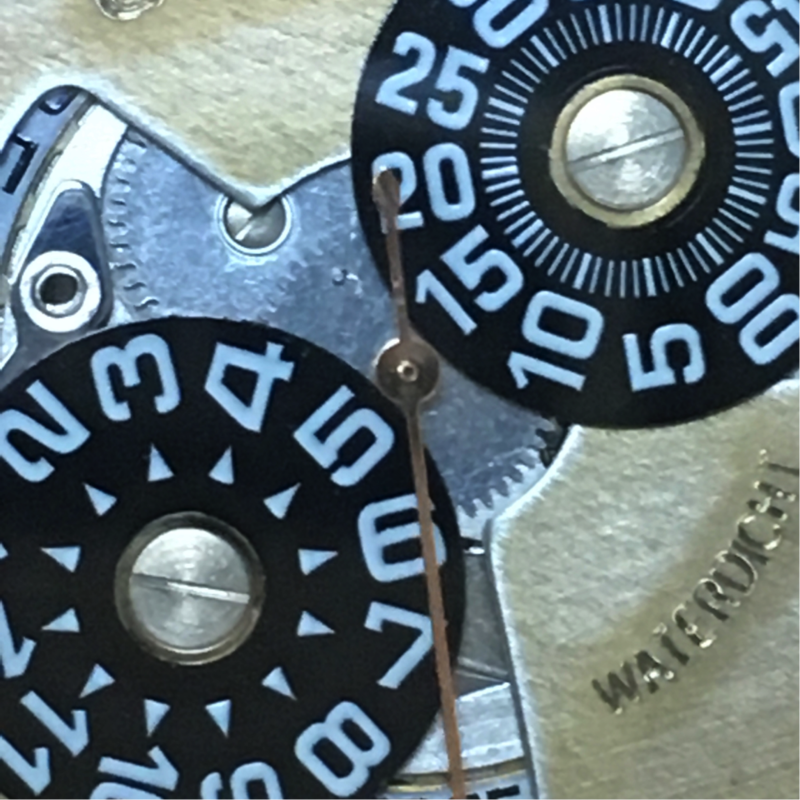 Like many of you, I found my way into watches through a mixture of artistic and mechanical interest, sprinkled with heavy and roughly equivalent mixes of ennui and expendable cash. Time keeps on ticking, and I seem to be fascinated with tracking its loss. So it was that on my 30th Birthday invitation some decades past, that I invited friends and family to a party via a reference to the Death Clock (http://deathclock.com), into which you enter your birthday, how fat you are (or aren’t) how much you do (or don’t) smoke, and whether you’re feeling pessimistic, sadistic, or optimistic (disclosure: feeling optimistic, I’m going to drop dead on March 28, 2060. I’ll let you know how that goes.) I thought it was funny as hell; my family and friends called privately to ask if I’d lost my ever-lovin’ mind. Anyway, back then in 2010, after searching the web and busying myself ogling all the watches of land (field), sea (divers), and sky (fliegers), I settled on a LumTec B16, which then was just a pretty cool watch within the budget, but I now recognize as a PVD-coated, coin-edged, B-dialed flieger with a Miyota 9015 automatic movement. If you’re still reading, I suspect you get the idea. My collection is presently sitting at around 30, and I’ve bought and sold dozens more since I got active on WUS back in 2013. Although I am fortunate to have the trifecta of mid-range divers—a gifted 16610 Sub and used copies of the venerable wavy-dialed SMP 2531.80 and (the best version) ETA Tudor Black Bay 79220 in red—I’ve been through and have an assortment of others in the so-called “affordable” range. I’ve also got a handful of custom designed and built watches. In fact, fully half my collection is comprised of one-off pieces not to be found anywhere else (in some cases, that’s just as well, in others, well, I think they’re pretty good). I’ve spent hour-upon-hour running through the usual forums, sharing laughs, flaming trolls, and generally building community in small ways, the better to ease the vitriol in the real world (except when I can’t help but add to it). And, indeed, through GTGs and other smaller exchanges, I’ve made some real-life friends and shared drinks in multiple cities and, indeed, countries. All of which brings me to my point: I thought I’d seen it all. I hadn’t. 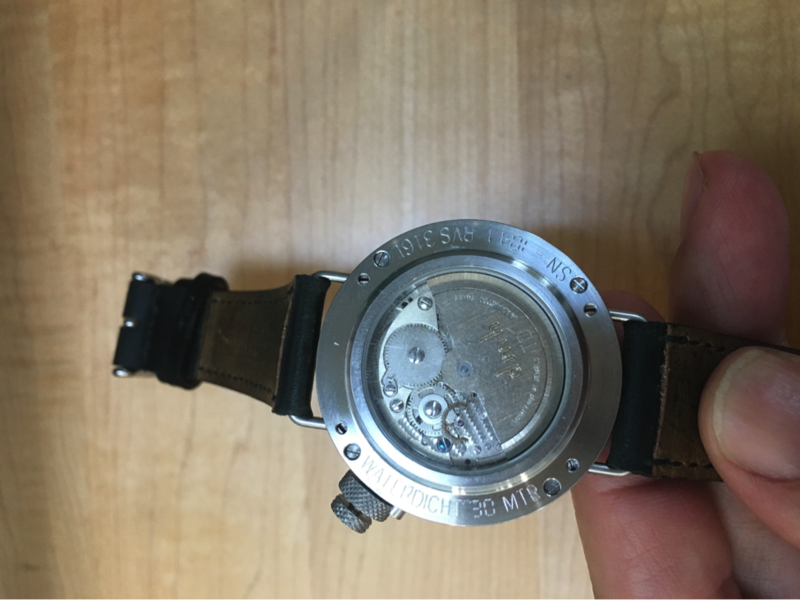 Searching a salve after the divisive November 2016 election, I happened to be at a DC-area WIS-gathering and learned, for the first time ever, that there’s a watch you can buy, hand-made, hand-built, customized, with a catch: it’s built by a Dutchman, 2 per month, 24 per year, with a four-year waitlist. Recognizing that would pull me through to the next divisive presidential election, I thought: there’s something to look forward to! So, I got the website, took a quick look, plunked down a deposit and hunkered down to wait. 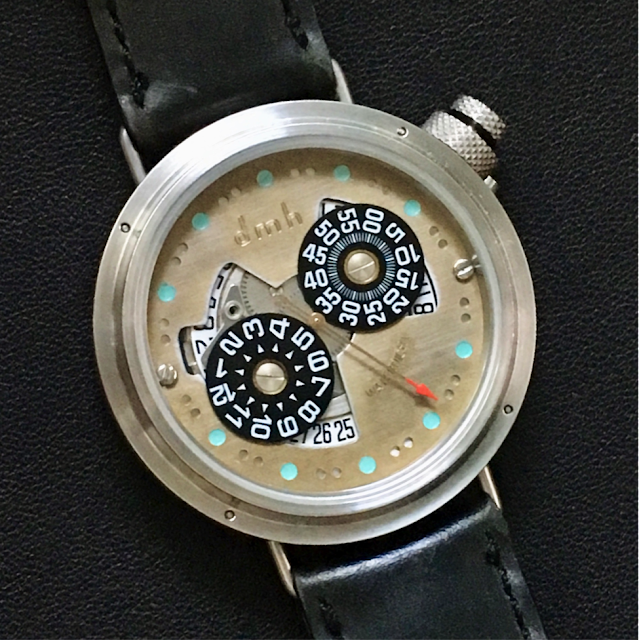 Old habits dying hard, and despite having sworn off any new pieces before my turn came to customize my own d.m.h., I happened to look online and saw—what?—the watch for which I’ve been waiting for the last 18 months for sale at a price too good to be true. 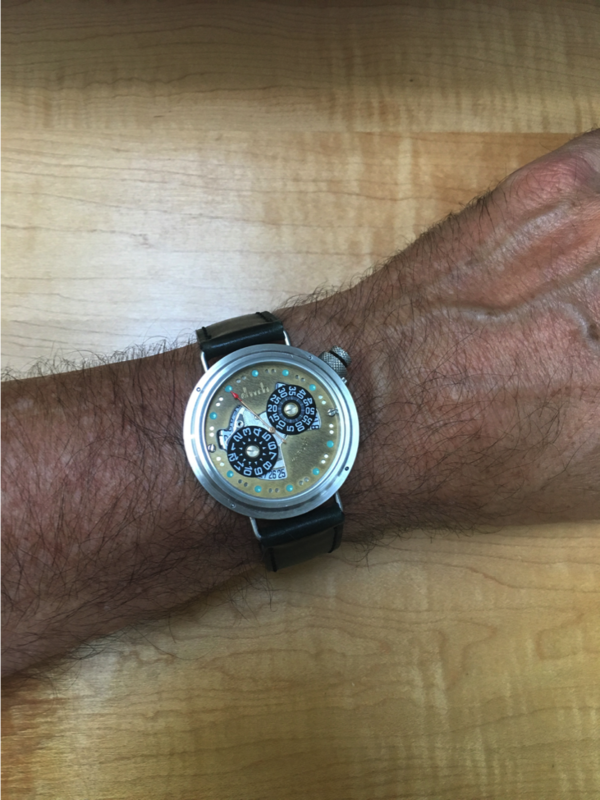 Not quite sight unseen, but uncharacteristically without asking for so much as a $1 reduction in asking price, I sent the money and just today received the watch: a lightly worn d.m.h. Jump Hour from 2011. It just arrived, and judging by first impressions, would’ve been worth the remaining 2.5 year wait. Fred Dingemans was fascinated by mechanical wrist watches. After a career in fine mechanics, he acquired machinery to produce parts for watches. This way he obtained some old machines his father worked with and Fred, as a child, played with. Fred restored the machines entirely, and now they are like new and good to go for many decades to come. In his atelier behind his picturesque dyke house, Fred creates his watches. The case and crown construction are designed by Fred, as well as all other parts. All these parts are produced in-house on the restored machines, which Fred knows so well. 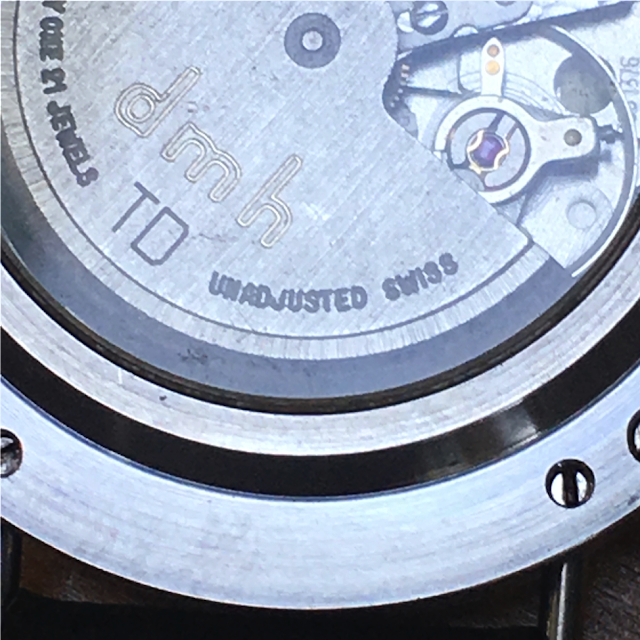 The movements used in d.m.h watches are new old stock Tenor Dorley movements. These movements where very popular in the 1970’s for jumping hour watches with a very futuristic design. The N.O.S. movements are entirely disassembled, cleaned, oiled and assembled again by master watchmaker Frans de Groot before they are used. As you can see, my copy has a brass-colored dial with jade-colored accents and a red-tipped seconds hand. If you visit the dmh website, you will see all manner of color combinations, all customer-conceived. A jump hour starts at €2495 ($2908 USD) without VAT. 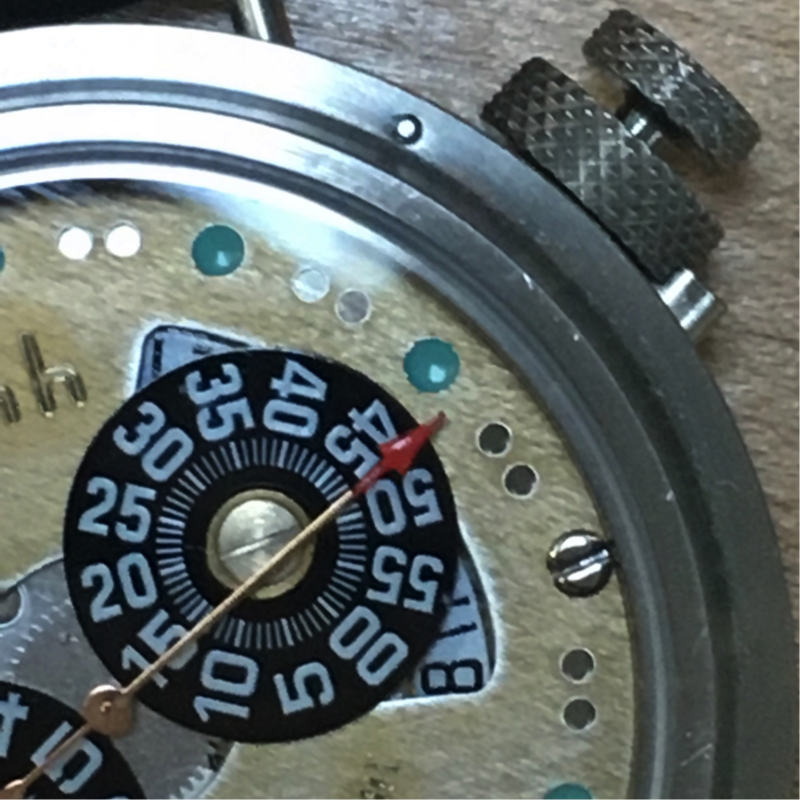 It features a nicely decorated, hammered finish visible through what I imagine is a sapphire caseback. … In 1970 Tenor Dorly introduced their own caliber family that was widely used by other watch brands. Tenor Dorly jump-hour movements are fully jeweled that made them far superior in quality to the great majority of Swiss jump-hour movements. In 1974 the Tenor Dorly automatic caliber became the base for the smallest automatic chronograph of that time…. In 1975, this small company went bankrupt due to contemporary development of the quartz watch. Happily, the watch comes with a multi-page instruction sheet. 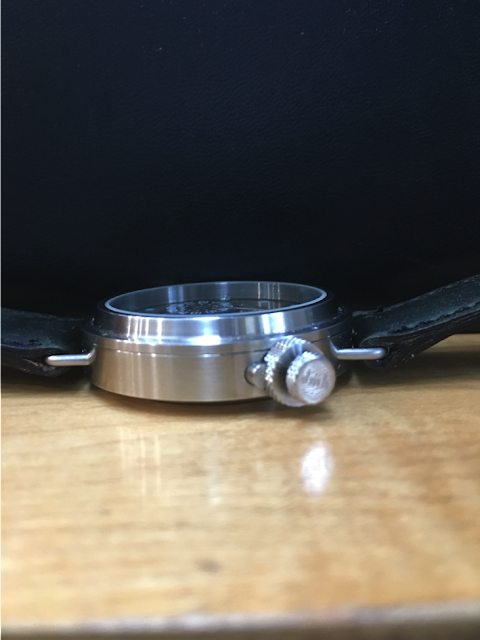 As you can see from the photo, the crown is a complex affair: two interrelated knurled knobs with a locking button. Press the button and turn the large crown counterclockwise until the button releases and re-engages, then turn the smaller crown (clockwise only, please!) to wind or, to set the time/date, keep on turning past 12 to get the date where you want it. Alas, no quick-set or hacking, at least not that I’ve yet discovered! Interestingly, the instructions don’t tell you how to read the thing, but that’s okay, I just like looking at it. I don’t care what time it is, and if and when I do, that’s what my cell phone is for!